The Clean Mobility Options for Disadvantaged Communities pilot projects address the barriers and transportation needs of low-income residents and those living in disadvantaged communities. 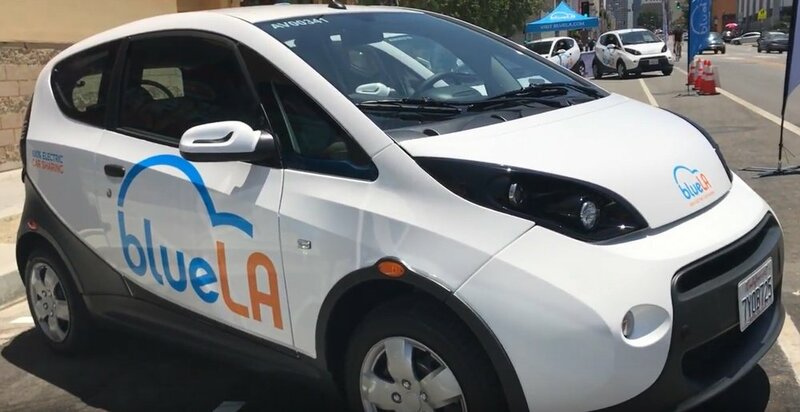 The City of Los Angeles received a $1.7 million grant to start a zero-emission car share pilot project, BlueLA, to operate in four Los Angeles disadvantaged communities. This BlueLA project will ultimately deploy 100 electric cars (EV) and 200 EV chargers and serve portions of Westlake, Pico Union, Koreatown, Echo Park, Downtown, Boyle Heights, and Chinatown by March 2019. Launching to the public in April 2018 with 25 EVs and 35 chargers in 7 locations, the project now has 70 EVs and 85 chargers in 17 locations. “For the first time in the City of Los Angeles, we are focusing specifically on disadvantaged communities. These communities are low-income and are disproportionately impacted by air quality. It was really critical for us to work with our partner Bollore [BlueLA] to establish a geography that aligned with our vision to bring clean, convenient, accessible transportation to these areas. Also, we are offering low-income rates for households that make under $35,000,” explains Marcel Porras, with the LA Department of Transportation. For residents who do not own a car, this program enables them to get to their destinations more easily. They can also drop the car off at any BlueLA station. Currently, there are approximately 1,000 members. Due to the success of the BlueLA car share project, the California Air Resources Board has tentatively selected the project to receive $3 million for expansion, which will add another 200 vehicles and 60 more stations throughout the disadvantaged communities, and an e-bike sharing program. This car share project will provide a reliable method of transportation at a low cost for residents in need and will help clean up the air at the same time. Visit bluela.com to learn how to rent an electric vehicle for your next trip.